Since early 2010, when I launched my social media strategy consulting firm Windmills Marketing (DBA Maximize Your Social), I’ve helped a multitude of companies through the creation and implementation of a social media strategy plan. When I launched my company, social media strategy was something that wasn’t talked about, but I knew it was the central element that companies needed to make sense and derive corporate-wide ROI from their social media presence. Without aligning business objectives with social media tactics through the creation of a social media strategy, companies truly end up spinning a lot of wheels with often very little to show as to what tangible business value their tweeting and posting has. I knew that I had to create my own unique methodology to lead companies in the social media strategy plan creation process, and working with each client helped me fine-tune what an ideal strategy should look like. Having a background in launching sales organizations from scratch in Asia, where I had to be both very holistic in approach as well as wear many corporate hats both internally and externally, prepared me well for talking to CEOs and corporate executives on the ROI of their social media presence. Over time I have observed that without a social media strategy, how do you know what you’re trying to achieve, what you should be doing, how well you’re doing, what you should be measuring, as well as determining the ROI of your social media program? With the advent of social business, a social media strategy must also look at the implications that your strategy will have on all of your internal stakeholders and include them in the planning. With the increasingly complex environment in which a social media program exists, it’s no surprise that creating a comprehensive social media strategy plan seems like a continued challenge for many: 83% of those recently surveyed indicated that creating a social strategy is still a major concern for marketers. Fast forward to last month when I compressed all of these observations and experience – together with my proprietary framework and methodology – into publishing the social media strategy creation book Maximize Your Social. Although I haven’t blogged much about social media strategy, now that the book is published, I plan to share more and more of my experience with all of you to help you achieve excellence in your social media program. 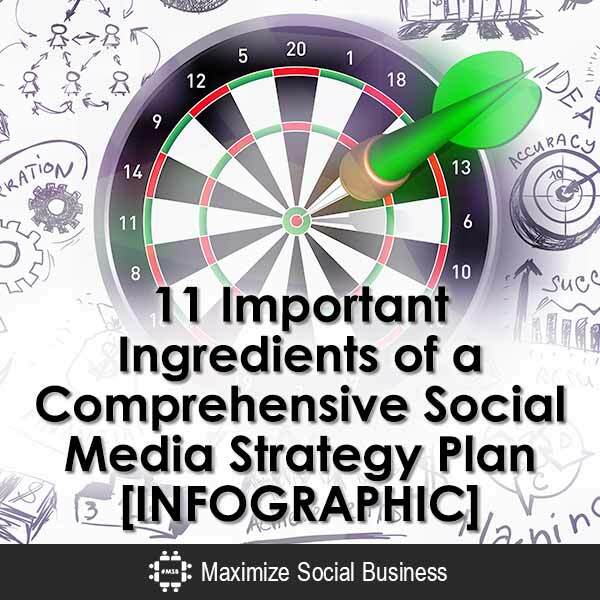 What are the important ingredients to include in a comprehensive social media strategy plan? Branding is all about being consistent across channels. This means that the same naming, color scheme, and imagery that is part of your branding guidelines needs to be applied to social media. The challenge, though, is that most branding guidelines don’t include “voice,” perhaps the most important part of your social media branding. Here’s another perspective on social media “voice”: Nearly 84 percent of employees surveyed believe that CEO social media engagement is an effective tool to increase brand loyalty, while 68 percent think that C-suite social media use enhances the perception that a company is honest and trustworthy. With that in mind, who represent (or represents) the voice of your company in your social media branding guidelines? And what will their tone(s) be? If social media users are communicating and sharing information in social media, what is your company going to talk about? Content provides the medium to help you engage in conversation – and creating content that is truly resourceful and shareable can have many long-term benefits to your company’s social media presence. Content isn’t just about blog posts, photos, and videos: Think outside of the box! Presentations, infographics, memes, and even discussions (such as in a LinkedIn Group) are all types of content that should be considered for your social media strategy. That being said, 62% of marketers blog or plan to in 2013 – and I’ve been blogging since 2010 as to why a blog should be a part of your social media strategy. Has your company started blogging – and is it completely integrated in your social media strategy? Description: If you’re just talking about yourself in social media, no one wants to listen. It’s only when you begin to curate content that is of interest to your followers and promote it together with your own content that your social media accounts begin to breathe new life. In addition, did you know that 85% of marketers surveyed stated that content curation is an important tool for establishing thought leadership? Does your social media strategy include which sources you plan to curate from – as well in which ways you plan to leverage your content curation activities? Don’t forget that crowdsourcing content is also a great way of curating – especially if it is from your own fans’ tweets about and photos of your products. Stat: There are more than 50 social networks having at least 10 million members. Which of these social media “channels” will your company include as part of your social media strategy? You can’t – and shouldn’t – have a presence on every social media channel, but deciding which social networks to engage in – and creating internal best practices and tactical plans for each of these networks – will form a sizable part of your social media strategy. While most companies concentrate on the more established social networks, depending on your industry the new emerging social networks of Google Plus, Pinterest and Instagram, or even more niche social networks, might be equally important. No two social networks are alike, and with limited resources you need to decide how much time you are going to spend doing what on each platform. This will also help you measure how well you are doing as well as maximize your ROI for time and resources spent on each platform. More frequent posting doesn’t necessarily make your social media more effective. Post strategically. For instance, one data point shows that when a brand posts on Facebook twice a day, those posts only receive 57% of the likes and 78% of the comments per post that a single post receives. Are you using data to properly tweak your frequency strategy for each social network so as to maximize the effectiveness of your posting? Engagement should be considered in both its proactive and reactive forms. While most companies do well at proactive engagement with their own content, proactively engaging with new social media users and reactively engaging with those who engage with your updates are equally important to create an effective social media presence. One thing to keep in mind about engagement, though, is that engagement should be a tactic to help you achieve your objective, not the objective itself. It’s interesting to note that 60% of Facebook fans and 79% of Twitter followers are more likely to recommend those brands since becoming a fan or follower. Is the engagement with your fans on each of your social media profiles worthy of being followed? Listening has more meaning than merely being on the lookout for complaints. Every engagement with a social media user is a golden opportunity, and being a good listener can also help you reap the benefits of utilizing big social data to help understand potential future trends for your products and services. A recent study showed 71% of customers who complained via Twitter were not contacted by the company. Does your company have a listening strategy in place? Readers of Maximize Your Social will get a fresh look into how I redefine what a “campaign” is in the age of mainstream social media. Think of it less as a promotional marketing campaign and more of an experiment to better understand – and more effectively engage with – your social media followers. That’s why I believe, as part of a comprehensive social media strategy plan, that it’s important to create campaigns on a regular basis – and remember to make them platform and/or content-specific to help give you more precise data for your future planning. We all know the many potential benefits of campaigns. One stat that I like is that 39% of Facebook users who click on a “pick your favorites” ad campaign post go on to share it with friends. Is your company experimenting not only with different campaigns on different social channels, but different types of campaigns that are best suitable for each channel? Amplification of your message via influencers can help make your social media more effective – if you are engaging with the right influencers for the right reasons in the right way. The task of determining who an “influencer” is is not a trivial one. Are you targeting the right influencers – for the right objectives? Whether they are the long-forgotten brand ambassadors that are your current employees, alumni of your company, or loyal fans to your brand, your social media strategy should always be looking for ways to engage – and reward – brand loyalty and amplification in social media. Brand ambassadors are critical because we all know of the famous stat that 92% of people trust recommendations from friends and family more than all forms of marketing. I believe one of the biggest untapped opportunities for businesses is to leverage their own internal employees as brand ambassadors. Because of social media’s impact as well as public broadcast functionality, a company needs to be always prepared for the worst. Make sure that your crisis communications plan includes messaging for each of the social media channels you’ll be investing in. One study suggested that 76% of social media crises could have been diminished or averted with the proper social media investments. Have you completely integrated social media into your crisis management planning? With each new social media strategy consulting client I revise and add more components to the above list. In fact, as I work with more companies on their organization-wide social business strategy, there are a number of new ingredients that are augmented based on the objectives and needs from each department. Think of the above list as a bare minimum to think about as you create our revise your own social media strategy plan. For your convenience, please use the below visual graphic to help you audit your social. Are there ingredients in your comprehensive social media strategy plan that are missing? Please chime in! Are all of these essential components included as part of YOUR social media strategy plan? I was reading your stuff and found it interesting. I recently shifted from a products based retailing company to a service based company. I am working in branding and marketing and i found the transition quite interesting but difficult. I work for a company whose main source of clients is online through our website. We also have a travel blog , Facebook, twitter, u name it we probably have it. The problem i have is how to go about increasing brand presence and have that presence result in increased traffic and hopefully customers. I also have a problem with measuring what a recent campaign has contributed to the business. I know posting relevant content that has value to your customers is important but how do i increase my brand presence across platforms like twitter, Facebook because it seemed to have stalled. The main objective of mine is to increase search rankings(sorry thats the business) and widen the social nets to catch more fish. Thanks if you read this. I would like to get your thoughts. Hi Gaurav, thank you for your comment and bringing up your question. I cannot provide free consulting on this blog, but I am looking to create a community which can help with your social media for business problems. Please go to my free Facebook community at https://facebook.com/groups/socialmediacoe. Thank you!